The 20th June is the World Refugee Day and a very important possibility to show internationalist solidarity with refugees. This year the Revolutionary Communist Internationalist Tendency organized a number of meetings and participated in demonstrations around this important day. Our comrades in Brazil hold a meeting in the camping of Frente Brasil Popular in Sao Paulo. They discussed about the revolutionary period we live in, the imperialist wars, the counterrevolutionary attempts in Latin America and the importance of solidarity with refugees and all oppressed. Our comrade Joao Evangelista held a speech on the need of anti-imperialist actions. In Israel/Occupied Palestine our comrades met with activists at a concert which was organized to fundraise for legal defense of an anti-fascist. The anti-fascist activist attacked the Zionist Yoav Eliassy aka “the Shadow” who is a well known fascist rapper. They discussed about the need of organizing self defense against fascists as well as in defense of refugees, migrants and nationally oppressed. Especially in Occupied Palestine it means also to stand in absolute unity with the Palestinian resistance against the Apartheid state Israel. Our supporters in Britain participated in the actions around the Aid Convoy to Calais. They also discussed with other activists and sold the LIBERATION (newspaper of the RCIT supporters in Britain). The Aid Convoy to Calais was an important sign of protest against the racist politic of the British government. It attracted a number of workers and oppressed, mainly migrants to get active around the World Refugee Day. The comrades in Austria participated in two demonstrations. One demonstration was against the fascist organization of the Identitäre Bewegung, a Europe wide fascist organization with origins in France (Le Bloc identitaire). The other demonstration was on the 20th June itself and was focused on slogans in solidarity with refugees. The RKOB also participated in a public meeting with migrants and refugees from Iran who belong to the national oppressed minority of the Ahwaz people. Comrade Michael Pröbsting was invited to hold a speech to the brothers and sisters. Also our comrades from the Dördüncü Blok in Turkey (with whom the RCIT keeps comradely relations) participated in a rally on the World Refugee Day. They raised the slogan of international solidarity as well as slogans against imperialism and racism. 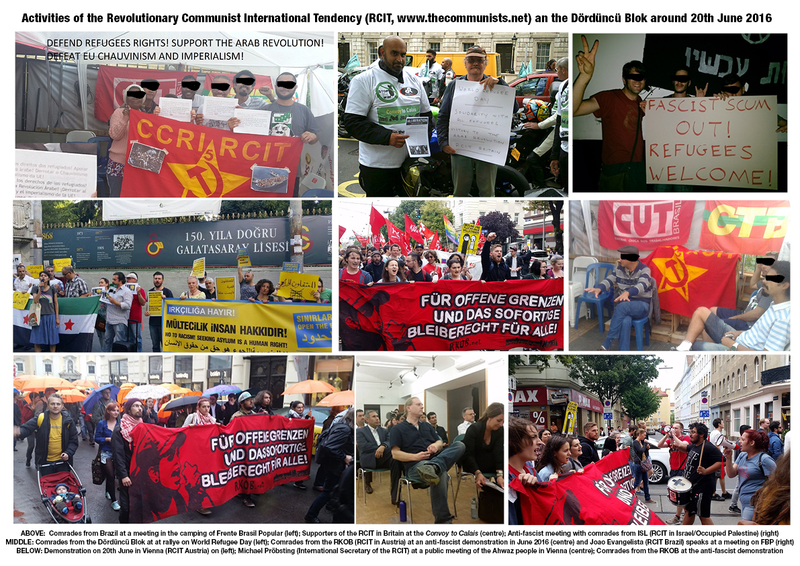 All in all it was an important and successful week of actions for the comrades of the RCIT and our comrades from Dördüncü Blok! We look forward to fight together with our brothers and sisters who are coming as refugees to Europe. We stand together against racism, against imperialist war and bloody dictators like Assad in Syria and Sisi in Egypt! We demand: Open the borders and let us fight together for the right to stay. Long live international solidarity!